Ignore them because I've made major updates since then, and this map took a year and a half of my late night free time; hence why it has 40 imported models lol. You get to fight black bandit armies, hang /w Blood Elf armies, and then there's the feared golden Knights of the Blazing Sun. Plus Irish, German, Spanish, Scottish, French, and English armies with heavy cavalry. None of the reviews are for 2 player co-op: MOST FUN!!!! I highly suggest it since the beginning is faster paced..and has pirates You and your friend should at least set your phones to speaker mode, because the missions are best with perfect team work. You can make an army instantly by entering the letter ' a ' as a chat message: press enter, type a, & press enter again, or you can make armies at your barracks. You can also make armies if it asks you to type ' d ' to defend. Just hit enter, type the letter d, press enter again, and an army will appear almost exactly where as intended. It's like a Choose Your Own Adventure: it might say type ' i ' to marry the king of Italy, or enter the letter ' F ' to marry the dauphin of France. There are lots of options and crucial decisions you'll have to make. I tried to make the level as open ended as possible, and certain decisions might have later consequences. The player 4 slot is only for two player co-op. As soon as the game starts you should get married; the sooner the better, unless you marry Italy then that might not be true. You also might want to type ' a ' /use your barracks, unless you're trying to save money for an alternate strategy. It would be wise to assign all of your French troops in to groups (hold down ' ctrl ' and press a number, then you can double click that number to automatically select that group). It will then ask you to type d to defend Scotland. Press enter and type d and press enter again. Select all the footmen and run them down to your ally orcs, and set them to defend. Select your 6 archers and run them down and use them to kill 1 knight at a time, always trying to choose knights/units who have low hit-points. From here it's lots of defending France, hence why it's good to have a French army. Also you have to defend Scotland all over again so save 20,000 for that instance. You can take a 10,000 gold loan if you need it, but that has consequences. Assassins will come and try to kill Mary. Put her in a throne room and block the tightest entrance with good units and set them to stand-ground. If a throne room is too far away you can also surround Mary CLOSE with lots of units(like 15), and set them to stand-ground. Eventually you will want to get Mary to Scotland where a free army (and more) is waiting, and lots of armies start attacking Scotland. The Scottish army is also better than France, and you will be closer to the 4 missions that take place. After the missions, the Braveheart intro will take place, and I recommend typing d / paying the measly 5000 gold, no matter what. After a dark knight invasion of everywhere, the next major event happens: The Tudors. If you ignore them they attack everywhere, and so I advise you take Mary to go talk with the Countess of Richmond, and then typing h to help. This is also the time you might want to start thinking about winning the game, because at this point England has spent most of it's money invading you. The year is 1558, you are Mary Queen of Scots, and it's not only your job to protect both France and Scotland, but to also invade England and storm Queen Elizabeth's castle and kill her before she kills you. So it's like Chess but instead of the kings being the most important, it's the queens. If Queen Mary dies it's GAMEOVER! If you manage to storm Queen Elizabeth’s fortress and kill her...VICTORY! So they finally made a good movie about all this: Mary Queen of Scots starring Saoirse Ronan who spent five years of her life making it. It was amazeballz to finally get to see a high quality movie of the events. This map is my masterpiece; not only can you get married to multiple people for different prospects like in the show Reign, but you can even have a baby that grows up; like The Sims. I really like having Zelda / RPG elements in my maps, like being able to walk up to someone and have them talk to you. Heck Link even stars in this map. It's payday! Sim City inspired me to have automatic paydays based on the amount of buildings you own. GTA inspired me to make some missions to obtain more gold. Refuse to attack and have good defenses...there's a chance you might see a total Walking Dead apocalypse. Dragons? Ya Game of Thrones inspires! New Ai programmed from scratch by me. They don't feed but attack you with entire armies, as in their defense and offense is impeccable! It took a YEAR & 1/2 to make this level. Beta tested over 100 hours/energy drinks for perfection. A Dozen never seen before skins by me. I've beaten it on hard, but never beaten it on 'hardest', whoever can do it first please comment so. On normal (don't type anything), my recent record is 54:06. My brother and I beat it 'normal' co-op in 54 & 1/2 minutes. How long does it take you to beat it on normal? Tranquil, HappyTauren, Kuhneghetz, Wandering Soul, Cavman, NhazUl, Direfury, HerrDave, Ujimasa Hojo, Radagast, Mechanical Man, Devine, Pyramidhe@d, MrHoon, Kitabatake, Cuore, Alethos, GreyArchon, Mephestrial, ViralHatred, Tillinghast, Dreacon, Grey Knight, Zerox, & General Frank. who's only job is to slay her(a new advanced assassin Ai), so block entrances, surround her close with friendlies, and don't loose because of an easily avoided mishap. Whenever the game requests money from you, it's either a good idea, or a good value. Owning farms to receive a payday is very important later on, when there are no missions left, and you need more gold. Assign your units in to groups. For instance the first thing I do is buy an army, and assign the 12 knights to group 1 (hold down Ctrl, and press 1). I reserve 6 & 7 for archers, and 8, 9, & 0 for armies on the opposite lands as Mary. I can't tell you what it took to program this level, a level of patients I never knew I had (it has inspired me to write a hiking/climbing/kayaking/mountain biking book for the Louisville area). It all started from watching the show Reign, I wanted a level where I had to think like a king/queen, and have to make hard decisions. Decisions like whom to marry, should you spend or save your money, and whether to defend or invade. Any fan of this level should download my other level Orcs vs Goblins & Humans 7.3P that took 9 months to program and has 7439 downloads. You have to collect 11 orbs from 11 spell happy bosses, and bring them to a gate to see the last boss's, which are castles that come to life. Lieutenants no longer have mana. I imported yet another model for the defense of France. Made a bunch of new players to reduce stutter due to the 96 units at a time limit. Changed player names to friendly or enemy to reduce confusion from having so many computer players. * The level is no longer boring since it now runs 40% faster than version 171. * Found a bug with the Tudors. * Gave the countries names. * Made a couple quests easier. * Added a bunch of new ai players to get rid of lag. * The scottish advisor only appears if Mary is still in France (pretty sure that was the one and only last flaw of my open ended level. 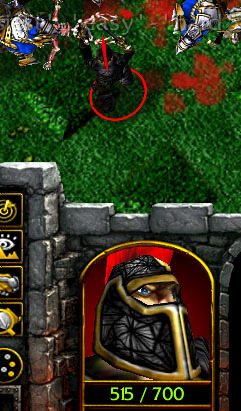 * Changed some of the enemy archers hit points lower so you can flank them more easily. **** I worked tirelessly with my friend who just bought Warcraft 3 so we could play this level...and its now 2 player co-op!!!!!!!!!! * All new update-system where it uses 'pauses all units' instead of cinematics. * Made a million updates for 2-player mode, including a new hero, and a much increased difficulty. * Adjusted the timing of the events so things weren't so sudden, and made the beginning no longer boring. * A barracks can now buy your army as well as typing 'A'. * All Heroes have spells that can be upgraded as much as 15 times. * It's a possibility you can buy more ships. * Made the terrain so that each country has it's own flowers/trees/rocks - look. * If you marry Italy the invasion happens between major events instead of a matter of seconds. * Found a flaw where if the witch burns herself and dies you don't get paid but it's fixed now. * Fixed braveheart cinematic and made the last boss harder. Please use a normal name like Reign or something and just leave those other game/material names to the credits or something. Also, don't use all tags... use the ones that actually fit. Neat idea and just what deepstrasz said. Just use the name Reign. I'll check it out and give my review later. Well, you have proven decent points and alright, I will try out the entire map and see if it still is fun after an hour, as last time I had played around 45 tops 50 minutes of it. One additional thing however, do take note, Reign has used magic plenty of times before, while, not exactly...normal magic, more so pagan magic through witches and rituals it can still be done. Besides, it would be neat to at least see some units have their own unique passives, but that is just up to you in all honesty. Also, I DID pick to marry the Spanish King, which honestly proved to be decently useful, but, at the time I did marry him and figured out how to actually do that, Nobels were already trying to kill me, so I just quickly evacuated to Scotland through avoiding the Nobels and smashing through England's defenses and reached Scotland. And well, I didn't want to go through a large damned army just to activate some events. Review: I just finished this map after 3 hours of playing. I have mixed feeling about this as it both fast-paced and at times, slow-paced. You might want to name the players something other than player [number]. Why do the towers have the original game upgrades if you don't have any lumber to upgrade? The invaders from the north are way too many. My armies didn't stand a chance. They are all appearing but you don't get any troops. Husbands don't have any abilities. You could be creative and vary them. They are spawning ships but you can't build more? Mary is pretty useless. What's there reason for even gaining XP if there's no ability to use, some aura for troops, some healing, something. Mary pregnant in the middle of the battle/run away. Not only tat but the camera shows Mary in places the character isn't (if in a boat). Because there are many troops on the map, units will not move normally anymore and stagger. You need to have less than 100 units moving at once for one player. Most of the time you don't have enough money to do much. Not to mention they're attacking you even when trying to rebuild (20 minutes? Really....). How to close the Scotland gates? Overall, poor game design, monotonous and random. Please delve into the Strategy/Risk zone of our Maps and learn from them. 1. Not sure what blue troops mean or that something accidentally flashed on you. Listen, if you want to take the feedback OK, if you don't please just don't reply at all. The blue troops are your troops right outside Mary's quarters... The Quest Log flashes as if a quest requirement has been either completed or discovered when text on the screen appears. The Quest Log however, remains empty. 2. There is like 100 custom units, and all Ai is controlled with unit groups of 12, so I had to stay organized. What does this even have to do with the point I wrote? I wrote, instead of having player names be like Player 1 etc., have them like France or Britain or whatever. 3. You get paid whenever its tax day, that's why it says that. Great, the Quest Log shouldn't flash and it would really be helpful to have a timer to know when that day comes. 6. Didn't stand a chance....I win every single battle plus I'll have 130,000 right before I win the game. Just cause you stink don't take it out on my level. Wow, work on your attitude mate. Your the map maker, of course you know how to play. Have a diploma too. 16. I spent forever trying to fix this. I made triggers that slowly make large armies disappear to prepare for the next battle. There is never more than 100 on the map at once I think, so I'm not sure what else to do. The following is not official and just my opinion on the subject. Both parties are free to ignore it if they feel so. I am not sure you should be rejecting it due to poor map design and bugs. Reviewing it with a low rating yes but "awaiting update" seems excessive and I do agree that much of your feedback is opinion based. Practically every map, no matter how good or bad, has tons of bugs. Some obvious, others might only be found out in years to come. Hence unless a bug is absolutely game breaking (unlikely to get to the end of the map) then it should not hold back a map being approved. Of course leaving them in feedback so the author can fix is still recommended. If something feels fair, is balanced or makes sense are largely opinions. Now of course as a player you do matter, after all you are the end consumer of the map, however if the author wants to listen to your suggestions or not is entirely up to them. Sure if they do not listen to any negative feedback chances are their map is not very good and will be rated low and get few downloads, however such changes might cause the map to deviate from their original vision of the map or upset other players of the map who share a different opinion. As such one really should not use such opinions to hold back a map being approved. Of course you are entirely free to rate the map badly if you do not like it and recommend players avoid wasting their time with, after all ratings are opinion based. "As the developer you have a lot of experience with the map as well as inside mechanical knowledge that most players do not. Where as a solution to a fight may seem easy to you, it might not be so for the average player. If most players cannot beat the map then chances are they will not post good reviews." I do recommend listening to some of his suggestions. The guy has played a lot of maps and knows his stuff. If he finds a lot of negative points about it then chances are most players will find similar points and review based on those. Many of his suggestions are also "polish" for a map. These can be small changes, eg changing the player slot names, that make the difference between a map looking like a rushed job and a really high quality map. I am not sure you should be rejecting it due to poor map design and bugs. It doesn't look unique or that it brings something new to the table. However, it doesn't only have to be me to have the verdict and I've specified this in the first review. If you want to be a map reviewer, go ahead, I don't mind at all but I'd really feel bad if I'd let this map be in Approved instead of Substandard. That's why I set it to Awaiting Update for improvements. Wish you would explain your map in F9 because you just get thrown in and dont know what to do or why anything is happening or whats possible. Also the descriptions of your events make the map feel really stupid. "England decided that england is weak" "and scotland too" ..couldn't get more basic and makes the map feel like a joke..
- A level that combines inspirations from GOT, Braveheart, Chess, The Sims, Zelda, Sim City, GTA, and Warcraft II. - The birth of a child, having it slowly growing up. These are the only things worth mentioning. We're referring to gameplay not that you named a character Queen Uninteresting. And those three points are present in other maps alongside a much better gameplay. I am not satisfied with this reply. Instead I would expect actual improvements to the map. Well. One hour in and I finished the map, heres my new review back from the old one. As I see most of the things I have said in the old one, so many of my points will be repeated here, but, feel free to respond or not. The map as a concept, can be seemed nice, but, it is not executed well, I will start off from that and will explain everything as you read further. The map is just, simple, boring and just RUSHES you in if you don't know Reign or have watched it, personally I watch that series religiously, it's one of my favourites. There are really no other tactics besides: Send your army to X point to defeat England or Pirates, all you gotta do at first is just, send the army in and watch everyone get slaughtered, specially if you have a hero, really all the micro you'd have to do is set the Swordsmen on Defend, thats it and perhaps microing your cannons if THANK JESUS LORD YOU'D EVER GET ANY to get them to move if they get focused. Heroes are literally the same as units, just more powerful, all having chaos damage and really no spells, just more microing is required for them. When to talk to an NPC, specifically those that tell you what to do to spawn an army, or close a gate or something, just make it have a message pop up from the screen from that said NPC to tell you what to do, instead of waiting idk how much in cinematic mode for one single message. Ships, which are CRUCIAL, do not exist, pretty much anywhere, unless you get the Spanish King. In the era, and a map thats set in Reign, requires naval combat, that does not exist, at all, instead, you get some transports to move around if if you don't pick Spain as your husband) to travel between the British Isles and France, which makes no sense without getting NO intervention when you are literally moving in the English Channel. Unless you have an understanding of the story of Reign, when its set, who are the characters, etc unlike myself who watches the series religiously, as I've said, you won't understand what's going on. Heroes should have names instead of: "King of X, Prince of X", the only two who have names is Mary and Elizabeth, who are important characters, but everyone else is as well. Events should have more detail to them, instead of "Nobles are rebelling just cause they think their country is going bankrupt" or, "England feels threatened, so they attack! HUZZAH! ", it just feels so rushed to the point its not even...enjoyable, in the least. What are farms used for? Hell, theres an entire hero that if you decide to marry him, he gives you 35 farms, although it isn't described anywhere what the farms do, for most it may not be obvious, but for me it was. Why so many units that are the exact same, just named differently? Improvement of terrain, its just....no comment. But, at least don't use the "noise" addition, that never makes terrain look good. Add more forests, like actual forests instead of cityscape trees, as France, England and Scotland have forests. Add more detail in general, terrain can do a lot. Actual custom units, each nation being better at X then the other nation at X, not having the same things over and over, make it that it is actually interesting when you're fighting and exploring your unit types. A son, instead of there always just being a girl that comes everytime Mary gives birth. Honestly, I did not enjoy the map, mostly I was bored and just ended up steam-rolling the English after I received a set amount of money to help me beat them and spawn a bunch of Scottish Troops as they are the most OP and also moved to Scotland alongside the daughter. The map has potential, but for now, it doesn't provide anything new to the table and stands as another simple big map that turned out to be not so great. Really, I have never seen a map set in Reign and I was just, starstruck when I first saw this map but then...disappointment. My original rating changes, from 3/5 to 2/5, honestly, I wanted to be a little empathetic when I gave it, but I just changed my mind now after thinking at how this map turned out to be like. Sorry, but, that rating stays unless you improve. I hope you don't give up, as I said, it has potential. Should England invade France because of Italy and France with a matter of seconds between the invasions? What's with the Flying Machine... you can just use a visibility modifier via triggers. There's one Ironborn in the base and one near the shipyard. Very annoying to move Mary when the ninjas come if all those princes start talking every time. Not only that but they don't even help you. The staggering of units is still present which is bad because it only affects movement but not attack. Archers still get to shoot without problems while the melee units have a hard time getting to them. Everything happens too fast especially when reaching Scotland. It's almost impossible to defend the base and at the same time get the gold wagon and/or cardinal. I got no cannons this time. It's a rarely brought out idea, and quite an interesting one to say. One would rarely see this kind of map, as it's sort of rare. So, yeah, it's quite original, except it takes multiple games as inspiration and doesn't execute it that well. Slightly below average of what I usually see. The choice of color is a big headache to the eyes. It's also mostly size manipulation of text in play. Units share similar designs despite being from different factions, though it's tolerable. Swordsman and Captain uses same model, please differentiate them. Terrain is average. I'd say the throne area doesn't really feels like one, and there's too much grass all over the place. I suggest to avoid pausing game mid cinematic, and use Pause All Unit instead. shipon or off and the copy of that trigger are both empty. Delete them if not used. What's with spam1 trigger? I don't see the reason having multiple copies of it, except the last one. You really need to use variable controls for these kind of stuff. Found some more empty triggers in child folder. There's a lot more to scan out, though I must admit your leak handling is good enough. Doesn't spot anything major of an issue, though could use some efficiency. Many units are copy-pasta of each other. It doesn't make it feel any different from each other. Even name are similar. Units are mostly only an engagement of attack. No abilities involved, except Defend. Unless you have an idea of Reign, you're gonna get thrown into disarray the first moment you're in the game. The invasion is swift fast hitting your door before you have a chance to properly adapt and even with reinforcement, it's difficult to make sense of what's going on early game. Apparently, a second run gives me a different initial event. However, the gist is still the same, with them appearing right off the bat without any early warning. Depending a country far away is a big challenge in single player. Could use proper transportation over english channel or additional way of attaining army. Those scout towers that suddenly pops out of nowhere, they are quite confusing for some. If it's for visibility, you can use the Visibility Modifier instead. In short, there are too many problems in regard to gameplay, as it's confusing to understand for a newcomer and player are lost in the middle of a big chaos they don't really understand at all (unless they have some understanding of the story). Major thing : it's quite unclear how to get more farm to increase payment. The gameplay is, sadly, the most troublematic part of the map. I would recommend to utilize Quest log to make newcomers have an easier time getting a grasp of the map. Critical Error -> Vote for Awaiting Update! Ok I've been working on it for about 6 more months trying to meet every single complaint. You should find it so cleaned up it's like a new map, very fun, I play it every day I would like to thank all the map reviewers for helping me address all of it's old flaws. The problem from previous versions still exist: the player doesn't have much time to adapt to the game early on during their first test, which can deter the player (at least for lower difficulties, especially the one so-called 'easiest'). When a certain person offers something to the player (like the escape boat), please mark them with quest mark or something. With the chaos that spawns, it's easy to miss them. Even better if info pops, a mark shows who gave the most recent one. Constructing a Farm has model issues. Use the Farm model in Build animation instead. The naming of the units. They are like Footman 1 Footman 2 Footman 3. I suggest grab a custom loading screen. Would improve map value. Please, use Visibility Modifier, they exist for a good reason. Map description could use more love, to be honest. Color choice is hurting the eyes. For this particular map, the biggest issue would lie in how to get the player to adapt to the game WITHOUT knowing anything about Reign or similar games (a very new player). In particular, 'easiest' would be the thing that provides the answer to this need. But for this map, it doesn't seem to be the answer. Minor and suggestion are optional but would be nice to see it implemented.